Sri Tallapragada Subba Row (1856-1890) had a very short period of life and yet his contribution to the work of the Theosophical Association is highly rich and commendable. It not only was interwoven with the Founders of the Movement but too equally with Sir S. Subramania Iyer and Sri Tukaram Tatia who were the principal instruments to bring his writings under covers of print. 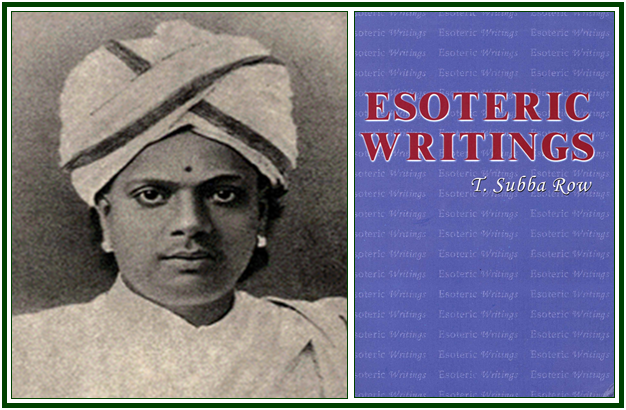 “A Collection of Esoteric Writings of T. Subba Row, F.T.S., B.A., B.L.” was brought out, posthumously, by the Bombay Theosophical Publication Fund in 1895, and this underwent two reprints thereafter. Some articles therein were also issued out by different publishing agencies, over the years, as pamphlets and booklets. It is a very pleasing and heartening factor for me that his precious writings are now being brought online through www.TheosophyOnline.com , www.FilosofiaEsoterica.com and their associated websites. The discerning readers will surely be benefitted by this benevolent action. Adyar, Chennai, 04 May 2012. Dr. N. C. Ramanujachary wrote the book “The Lonely Disciple”, a Monograph on T. Subba Row, which is published online and can be found in our associated websites.